GIBSON – 6th December 2018, peacefully at The Marie Curie Hospice, Belfast. William Stanley, late of Belfast and Portstewart. Darling husband of Valerie, loving father and father-in-law of Victoria and Patrick and Richard and Hannah and wonderful Papa of Benjamin and Hugo. Service of Thanksgiving will take place in the Causeway Coast Vineyard Church, Coleraine on Saturday at 2.00pm. House private. 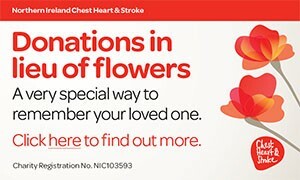 Donations in Lieu of flowers to Marie Curie Hospice c/o 1A Kensington Road, Belfast BT5 6NF. All enquiries to H Wade & Son, Funeral Directors Tel 02870343438. “1st Corinthians Ch.2 v 9”. Darling son of Dorothy and the late William Gibson and much loved brother of Joan, Alan and Ian, brother-in-law of Cecil, Heather and Karen and their families. I am sorry to tell you that William Stanley GIBSON has passed away.